Made from one single silicon crystal (also known as mono-Si, monocrystalline silicon, single-crystalline silicon or single-crystal-Si), monocrystalline solar panels are proven to be more efficient than other solar panel technologies even if they are quite more expensive. They are characterized by the uniform look and even color (an indication of high-level silicon purity). Furthermore, you’ll notice that each cell isn’t a simple rectangle but comes with rounded edges. While this is a rather simplistic summary of a more sophisticated process, it should give you an idea of how these particular type of panels are made. These solar panels are made from polycrystalline silicon (also known as p-Si, polysilicon, multi-crystalline silicon or mc-Si). They differ from monocrystalline silicon cells in that their production does NOT include the Czochralski process. Instead, it’s rather straightforward as melted silicon is poured into molds which are cut into square wafers after it’s cooled. Because of the inherent “impurity” in polycrystalline silicon-based panels, you’ll observe that their color isn’t uniform as you have with monocrystalline cells. These are made with thin-film solar cells (also known as TFPV or thin-film photovoltaic cells). These cells are produced by depositing photovoltaic material (it could be one or multiple layers) on a substrate. These cells are grouped based on the photovoltaic material deposited. There are four distinct categories: organic photovoltaic cells (OPC), copper indium gallium selenide (CIS/CIGS), cadmium telluride (CdTe) and Amorphous silicon (a-Si). To make it easier to see the differences among the three main categories of solar panels, we’ll pick various factors and see how each of these panels compares to the others. The production process for monocrystalline solar panels is much more complicated and expensive when compared with polycrystalline panels. Furthermore, the Czochralski process which is used in the production of monocrystalline silicon means that a substantial amount of the original silicon goes to waste. 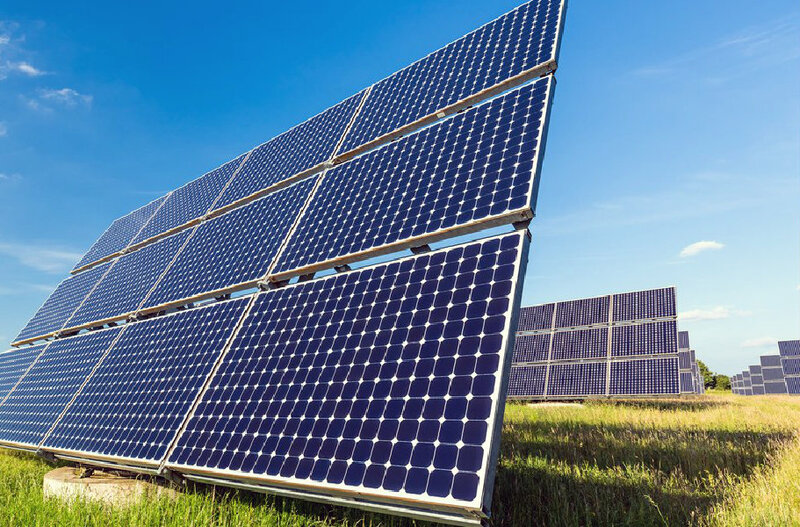 Polycrystalline panels, on the other hand, are made in a straightforward production process that does NOT lead to the waste of significant amounts of silicon. In comparison, mass production of thin film panels is much simpler than any of the crystalline cell types. In addition, they are also more flexible which increases the possibilities as far as using them for a wider range of applications. Cost-wise, monocrystalline panels are the most expensive while thin-film panels are the least. With efficiency rates of up to 20%, monocrystalline solar panels are proven to have the highest efficiency (That is, the percentage of solar energy received that’s converted to electricity). Polycrystalline-based solar panels come second in this regard since they can record efficiency levels of up to 16%. Thin-film panels, by comparison, are a distant third with an average of 9% efficiency (even though there have been records of efficiencies of up to 13%). For the same space, monocrystalline solar panels (from the best brands) can deliver up to 400 percent of the electricity that will be delivered by thin-film solar panels occupying the exact same space. And by reason of this greater demand on space, you’ll also need more support structures and cables (generally referred to as PV-equipment) if you opt for thin-film panels. This space-constraint makes thin-film panels less than ideal in areas where space is expensive and hard to come by. So how do polycrystalline solar panels compare in this regard? You’ll need more space than is required for monocrystalline solar panels but far less than needed for thin-film solar panels. All that said; it’s important to bear in mind that the quality of the particular brand you opt for can make a big difference in these factors. These are given where all other things remain equal. Compared to monocrystalline panels, polycrystalline solar panels have a lower heat tolerance. This means that their performance is more adversely affected by high temperatures in comparison with the former. However, thin-film solar panels are far less impacted by high temperatures. If you want solar panels that will last the longest, then your best bet is monocrystalline solar panels. There’s a good reason why manufacturers are confident enough to give 25-year warranties on them. They live long. Polycrystalline panels come second in longevity but the worst of the three in this regard are thin-film solar panels. They degrade much faster and so generally have much shorter warranties. The uniform look of monocrystalline and thin film solar panels makes them more pleasing to the eye than polycrystalline panels.